We have Jelly Soap! Our Vegan Shower Jelly Soap is irresistibly fun to use and impossible to ignore once you see it jiggle! Get your hands on the hottest Personal Care Product of the Year! Get your hands on the hottest Personal Care Product out there today. Our Vegan Shower Jelly Soap is the real thing, not a homemade, Non-Vegan, gelatin version and is inspired by the Shower Jellies made popular by Lush Cosmetics. Shower Soap Jellies are so much fun to use! 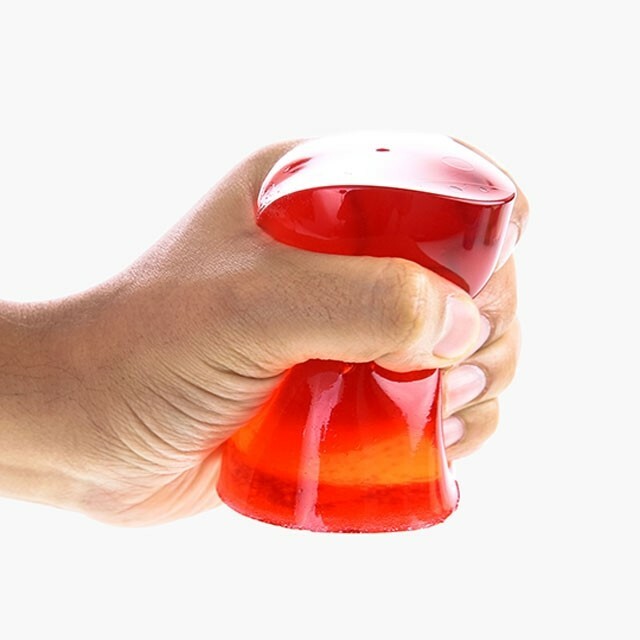 They shake and jiggle holding their shape until you tear off a chunk and use it in the sink or shower. This Soap isn't just fun and games, it has Glycerin Soap as a base, ensuring that it moisturizes as it cleans, leaving you refreshed and ready to go! Developed years ago, Shower Jellies Soap sat in relative obscurity until a video featuring them dancing and bouncing along surfaced online. Suddenly, everyone had to have them. Customers fell in love with this fun to use, great looking and smelling product the minute they saw the video. We soon realized we wanted them too! Our great lab team did some great research and came up with our own, Vegan formula that is even better. Our Formulation is more stable and easier to work with, letting you customize your Jelly Soap easily. Take full advantage of the playful nature of Jelly Soap to market to a young crowd. Use bright colors and fun scents to capture the imagination and attention of these picky customers. Encourage them to pick one up so they can hold and smell your little jiggly gems. You can also reach active, sports loving customers by showing them how great your body feels after showering with a frozen Shower Jelly Soap scented with bold Menthol/Minty fragrance. Yes, that's right, our Jelly Soap can be put in the fridge or freezer to give you a shower experience like no other! Our Jelly Soap starts out as our simple, yet moisturizing Glycerin Soap Base. Carrageenan Extract (Chondrus crispus powder), an ingredient found in Seaweed, is added to give it it's signature jelly like consistency. Our Jelly Soap Base is amazing as is but it can also be fully customized by adding one of our Great Scents, Additives or Extracts. If you are already familiar with Melt & Pour Soap Bases, working with our Jelly Soap should be very familiar to you. You simply melt the it over low and steady heat, preferably over a double-boiler until it is fully liquefied. Add Scent, Additives and Color and pour into your containers or molds. More detailed instructions are available under the Characteristics/Mixing Instructions tab. These soaps literally stop people in their tracks! And they can't stop jiggling them around once they put one in their hands, especially kids! Ordering more today! known as carrageenan powder. An extract made from Irish moss. This is a powder that turns to jelly when boiled with water, a great botanical alternative to animal-derived gelatin. Fragrance Tips - As always, test your fragrance in small batches before you commit to a large batch. 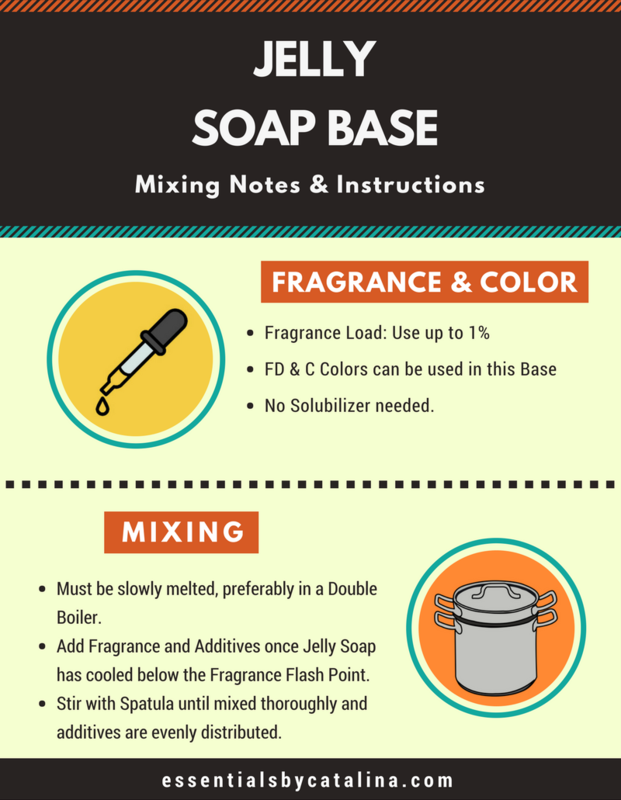 We recommend no more than 1% Fragrance load be used for our Jelly Soap Base. Not all Fragrance Oils have the same viscosity and adding more than 1% may affect the characteristics of the Jelly Soap. Please test your fragrance in a small batch to ensure compatibility. Melting & Pouring Tips - We recommend you use a double boiler to heat and melt our Soap Jelly Base. This will ensure that it heats slowly and gently, with minimal foaming. Gentle, minimal stirring will ensure everything melts evenly, especially in larger batches. Add fragrance and colorant while Soap Jelly is liquid, reheat as needed. A microwave is perfectly fine for a small batch, especially when testing a fragrance. If using a microwave for a larger batch, stir often, but gently, to avoid foaming and uneven melting. Use care when pouring into molds as liquid will be hot and may warp some plastic jars. We have found that cooling your jars in a cold water bath as you pour can help avoid the warping issue.